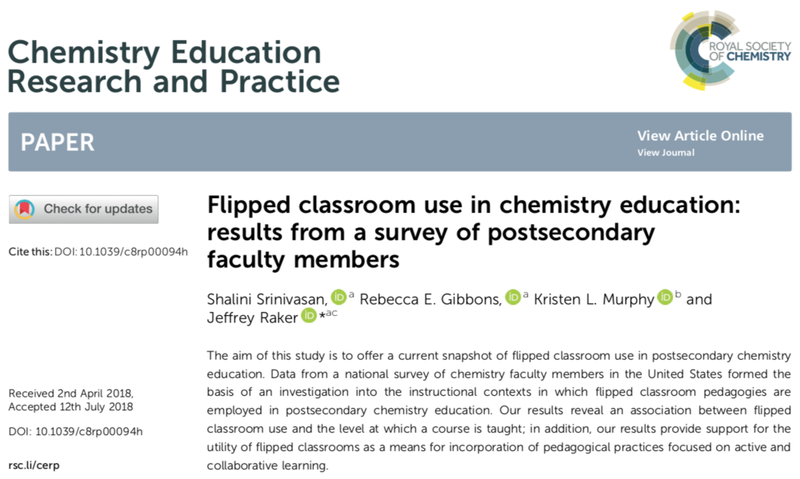 "Flipped classroom use in chemistry education: Results from a survey of postsecondary faculty members" - New CERP paper! Dr. Shalini Srinivasan has published work on the prevalence of flipped classroom use in postsecondary chemistry education in the U.S.
Abstract: "The aim of this study is to offer a current snapshot of flipped classroom use in postsecondary chemistry education. Data from a national survey of chemistry faculty members in the United States formed the basis of an investigation into the instructional contexts in which flipped classroom pedagogies are employed in postsecondary chemistry education. Our results reveal an association between flipped classroom use and the level at which a course is taught; in addition, our results provide support for the utility of flipped classrooms as a means for incorporation of pedagogical practices focused on active and collaborative learning." Srinivsan, S., Gibbons, R. E.**, Murphy, K. L., & Raker, J. R.(ASAP). Flipped classroom use in chemistry education: Results from a survey of postsecondary faculty members. Chemistry Education Research and Practice. Newer:"Development and evaluation of the organic chemistry‐specific achievement emotions questionnaire (AEQ‐OCHEM)" - New JRST PaperOlder:BCCE 2018: 11 Papers, 1 Poster, 2 Symposia, & 4 Workshops from the Raker Research Group!! !